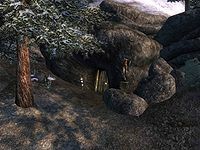 Echo Cave is a medium-sized cave west of Bruma containing necromancers (quest-related). 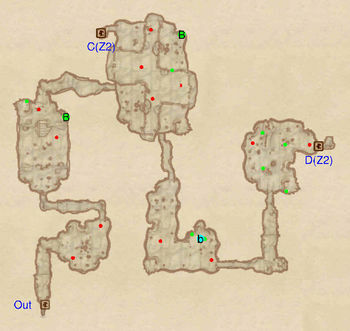 It contains three zones: Echo Cave, Echo Passages, and Echo Necromancer's Chamber. This cave is inaccessible until you acquire the key during the related quest. After the related quest, the only change is that Mannimarco is no longer present. Echo Cave also appeared in ESO. 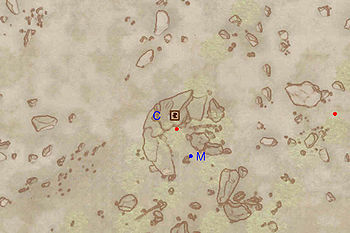 This location's map marker (M on map) is named Echo Cave (editor name EchoCaveMapMarker). The entrance door is NNW of the marker, 50 feet away. This zone is fairly linear and easy to navigate. There are five rooms, each containing two enemies, although the third may contain up to four. This room has two levels, but you will only be able to access the upper one when returning from the previous zone through door C. This will allow you reach the boss chest at B, by using the nearby root and jumping across. 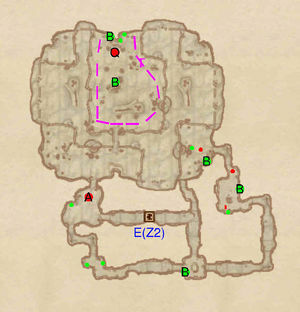 In terms of loot, there are two chests in the second room (one of which boss at B), one in the third, two in fourth and all of four in the last one. In the first room you enter you will find two enemies guarding a minor loot chest, with another further along the corridor. The second room is at the bottom of a zig-zagging canyon containing four enemies. Try to use the turns to your advantage to avoid fighting them all at once. The final room contains two enemies, a bedroll (b) and a chest. 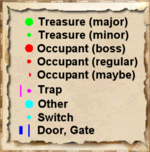 Use door E to enter Mannimarco's lair. On your way back, head south to door C to return to the first zone. Another enemy and two chests are nearby. 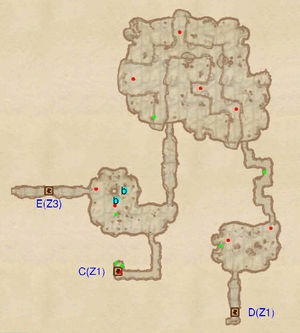 This zone's main room is a large cavern with water ringing an island where Mannimarco has made his lair. There are three options to access it. In the first room you will find a Necromancer Adept (A) and a minor loot chest. The door to the north leads directly to the cavern. Continuing along the southern corridor will gain you two minor loot chests. Once you arrive at a flooded tunnel, swim down into a small room containing a boss chest (B). At this point, you can swim along the northern corridor, which leads to the main cavern. Alternatively, you can head east. After a quick swim, there is a room with up to two enemies, a minor loot chest and a boss chest (B). You will then emerge in the southeastern corner of the main room, with a enemy and two chests for company. One of these is a boss chest (B). Proceeded to Mannimarco's island and move toward him (Q). After his little speech, the bone claws at T will raise up, preventing your escape. Slay the King of Worms and loot the four chests nearby, two of which are boss chests (B).